During the first week of the SCD (the intro diet, specifically, which must be followed for the first 3-5 days and is crucial to the healing process), I was tired and lethargic, but my body felt extremely light. The light feeling was probably because I wasn’t bloated or experiencing discomfort for the first time in a a very long time. It’s not uncommon to feel this way during the intro diet because the body is going through a lot and it’s essentially the initial die-off period of the bacteria. Additionally, the foods allowed on the intro portion of the SCD are very limited and do not yield many calories, even if you try to eat a lot. Because I was still going to yoga and working out during this phase, I really had to increase my intake of these foods, but it still wasn’t enough. Even though I didn’t weigh myself, I know I lost weight during that week. The foods I ate during this phase included eggs, unflavored gelatin made with 100% pure grape juice, homemade 24-hour yogurt, dry curd cottage cheese, eggs, homemade vegetable broth (I didn’t do meat then) and some baked fish fillets. I ate variations of these foods for all my meals during those five days. Funny, I found this picture on my phone from a while back. 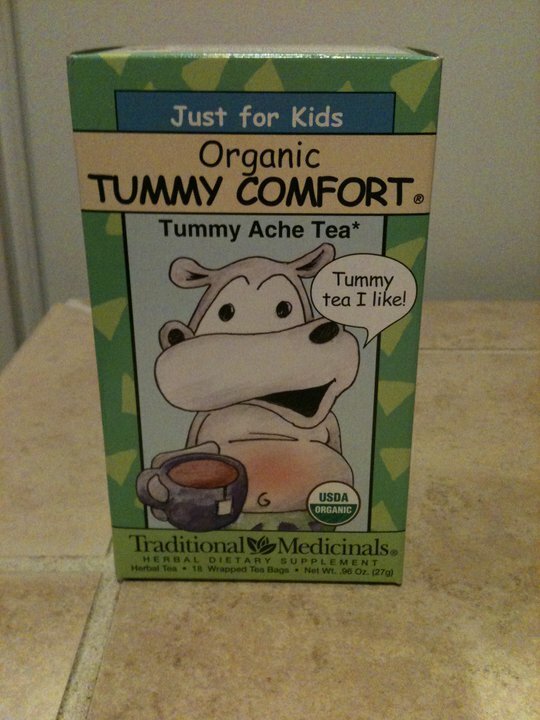 Jesse went out and bought this for me one night because my bloating was so bad and we were out of digestive aid tea. I made it one month on the SCD before I made the decision to add chicken and turkey back into my diet. I was having a hard time getting enough protein, especially for how active I am, and knew my body needed it. I did a lot of research and spoke with my naturopath about it. She thought it was a good idea, but did not push or force me in any way to do so. It was my decision. So, Jesse and I bought a rotisserie chicken from Whole Foods to eat for dinner one night, and he cut me a little piece. As soon as I tasted it, I knew it was exactly what I was missing. It tasted good and felt good too. Needless to say, I asked for more, and the rest is history. 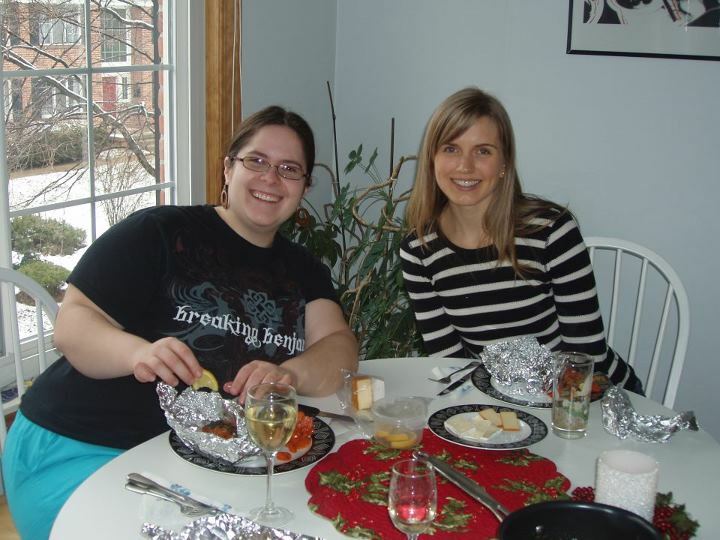 A tasty homemade lunch with my friend, Katie. Lunch was compliments of my sister, Amanda. At this point, I was only a couple months in on the SCD. This was just after Christmas, back in Michigan. Fast forward to today, and I’m now in advanced stages of healing and will reach my one year mark on the SCD in October of 2012. I plan to adhere strictly to its guidelines at least through the end of the year (2012) and then afterward, will combine its principles with a paleo/primal approach. It really won’t be that different, but will allow me to try certain SCD “illegal” foods (if I choose) like cocoa powder, balsamic vinegar, sweet potatoes/yams, etc. These are all paleo/primal-friendy foods, but like I said, are not allowed on SCD. If my body doesn’t agree with any of the “illegal” foods I try, then I simply won’t eat them or will accept the consequences (though that’s not usually worth it). About 5-1/2 months in on the SCD. 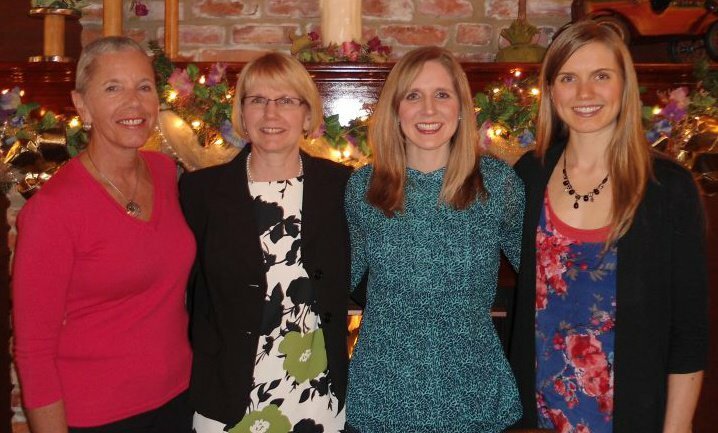 I’m on the far right and pictured (from left) with my Aunt Penny, mom, and sister, Ashley. This was at my Grandpa Boboltz’s surprise 90th birthday party, which I flew home for. It took a lot of patience to get to where I am now, along with a lot of reading and research. I didn’t eat anything raw for the first several months (including fruit — everything had to be cooked with the exception of avocado and ripe bananas), didn’t eat nuts in any form for the first month and didn’t even start eating raw nuts on their own for several months. I tried eating raw mixed greens a couple months in, along with a raw apple (with skin) and was in total agony, and didn’t do it again until I knew my body was ready. Also worth noting, in addition to poultry and fish, I now eat high-quality red meat as well. 8 months in on the SCD. Dragonfly pose. One thing that was super helpful throughout my healing was the phases charts from the SCD Lifestyle Surviving to Thriving book from scdlifestyle.com. I don’t actually own the book, but my naturopath gave me a copy of the phases charts. Even though the phases are all individual and not a specified amount of time (for example, it doesn’t tell you to stay in a phase for one month before moving to the next), they’re helpful because they tell you which foods to try and in what form (raw, cooked, peeled, etc.). It takes some patience and experimentation to know when to move into the next phase. I definitely didn’t rush any of the phases. 8 months in on the SCD. In the beginning days of this diet, I was bummed that I could no longer eat tempeh, brown rice, chickpeas and quinoa, and anticipated eating these foods again once I was healed. Now, with everything I’ve read and learned, along with how I feel, I have no desire to eat grains, legumes or soy. I know what those foods do on the inside and how great I feel without them. I’m much better off, especially now that I eat meat. I actually could try such legumes as black beans, navy beans, lentils and split peas (properly soaked and cooked), which are all advanced foods on the SCD, but again, I have no desire. Mid back squat (135 lb) on the last day of my weight training class in early August of this year. 10 months in on the SCD. Note, this class was part of my fitness technology program at PCC. A few interesting things that I’ve noticed about my body, besides the absence of my symptoms, I no longer get a bump around my tragus piercing (hard, pointy piece of cartilage by the ear canal). I used to consistently get a bump around that piercing, which would often fill with pus or blood, nearly every few weeks. It’d go away and then always come back again, and this had been going on pretty much since I got it pierced (after the initial healing process). Keep in mind, it had been four years since I got it pierced! Anyway, I no longer have any issues with this, which is awesome. I also notice that my skin has more of a glow than before and have even had people comment about it, which is always nice to hear. Something else that I was not aware of, but my mom shared with me, is that I no longer have a weird smell about my breath. I know that sounds strange and it is, but she said there used to be this odor – not like bad breath or anything, but just an odd smell – that came from my breath. When I went back to Michigan for Christmas back in December 2011 – only two months in on the SCD (and after taking the antibiotics) – she shared this info with me for the first time and said that the odor was gone. She said she had been noticing this odor for years and was blown away by its disappearance. I was thankful to hear it was gone…after all, that’s a bit embarrassing and I had no idea! It obviously had to do with the bacteria and hydrogen in my gut. So, to sum things up, I’ve been on quite the journey over the past several years, but have learned so much along the way. I wouldn’t be where I am today without my former experiences, whether they were good or bad. I’m proud and happy where I am now, and have never felt better or stronger. I’ve become extremely passionate about health, wellness, yoga, fitness, and nutrition and owe it to this journey. I’m excited to finally be pursuing these passions (from a career standpoint), so that I can help and teach others, and continue to share my story. I appreciate all your support and thank you for coming along for the ride. This was taken recently during a workout at Recreate Fitness, where I train and work. 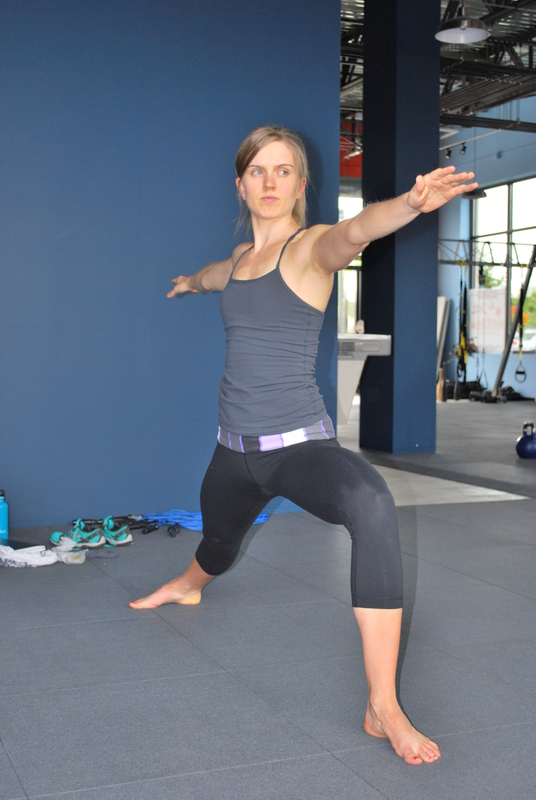 11 months in on the SCD – September 2012. First of all, you look amazing. It’s awesome that you were able to stick to such a regimented plan, follow through, and reap so many benefits. Definitely an inspiring story/reason for me to not slack on my own nutrition! Aw, thank you! Your kind words are much appreciated and I’m happy to hear my story is of inspiration to you. I was strict with myself for a reason and dedicated 100% of the way because I knew it’s what my body needed. I’m grateful for the whole experience and where I am today! Love it Alisa!! You look and sound great! Thanks for sharing your journey! Thanks, Kristen 🙂 I enjoyed sharing it! Awesome story of continuing success! Thanks for sharing it with us. I have also seen many symptoms go away by following a Paleo diet… It’s pretty amazing to see what foods we think are good for us, actually aren’t! Great to read your story, gives me inspiration to continue on my Whole30 journey and see where it will take me. Thank you, that’s so nice to hear 🙂 Best of luck on your journey! Congrats!! The changes you’ve made look good on you. Love the dragonfly pic! Thanks a bunch, Corrie Anne! That means a lot and is wonderful to hear 🙂 I appreciate you reading my story. Yes, the dragonfly pic is amazing. I love the story of your journey, and to think – it’s just the very beginning of a much healthier, stronger, pain-free road, where so much more is possible and enjoyable. Thank you for sharing it. Thank you, I appreciate you taking the time to read my story. Your kind words make me smile too! Thank you so much @eatandgetmoving. That’s so wonderful to hear and I’m glad it raises some question and curiosity for you. I’m sure you’ll get there in due time, but you have to be willing and ready, of course. Once you give up certain foods and begin to feel better, you won’t even be tempted to eat those problematic foods. It reaches a point where it’s not worth it. Eatandgetmoving, I really wish you the very best! I know it’s hard, but I PROMISE (cross my heart, hope to lose a wheel, stick a needle in my tire….) that moving on to the next step you already know is right for your body is so encouraging and empowering. So “get moving”! 😀 Haha. And if you need support or someone to talk to, comment on my blog and I’ll get back to ya. You are a legend! I am on a candida diet at the moment and have been for the past 6 or so months, makes me realize how sh$t I felt before when you cut all the crap out. Aw, thanks myfoodreligion! That’s sweet of you to say, but it wasn’t easy to get to where I am. It was a lot of hard work, but I was dedicated and determined. It really is amazing to reflect on previous eating habits and tendencies, isn’t it? Needless to say, I’m happy where I am right now! Thanks for reading my story. I just read your story and while I’ve been learning for some time about the importance of eating the right foods for human beings, I still find myself amazed by the journeys people have lived through, and how dealing with nutrition in a relatively simple way can make such a difference. Your journey in particular really highlights this point, because even when you think you’re eating commonly accepted “healthy foods”, sometimes you’re still not really eating healthy. Thank you, Sean. Your words are very meaningful and I appreciate you reading my story. Thanks for the blog follow too! I’m taking the exact approach you used for sibo but I have one question. Did you take probiotics while using xifaxan/rifaximine? Thanks. Hi Hank! I did take probiotics, but not right away and not with the xifaxan/rifaximine. My ND had me start taking very specific strains a few months or so into my healing. Not all probiotics are appropriate during SIBO treatment and she had a list of 4 or 5 safe ones for me to choose from. The one I took was called Florastor. I was making and eating 24-hour yogurt while taking the xifaxan/rifaximine though. The nice thing about that treatment is that it targets the small intestine directly and doesn’t get into the bloodstream. Anyway, hope that helps and best of luck with your healing process! I will be starting xifaxan/rifaximine on Monday for 14 days. I’m with a ND but not very experienced with SIBO/leaky gut . Who was your ND ? How long were you in the intro diet and the other five stages in total ? And what were you able to eat ? Were you having gelatin ? Were you taking all the supplements while on the intro and 5 stages ? I have just started scd to get off SIBO. Your story is really inspiring and I want to cure SIBO like you too. I hope I will be cured soon.